If you run a restaurant or other business that requires the use of a grease trap, you know that keeping your grease traps clean is extremely important to the functioning and cleanliness of your business, and keeping a clean and properly-maintained grease trap is part of complying with local environmental regulations. For fast, professional grease trap cleaning in Windsor-Essex, contact Hernandez Sanitation. We will make sure that your system keeps flowing the way it’s supposed to. Having your grease traps professionally cleaned will help prevent blockages, odors, and the risk of grease spilling into the sewer system. Keeping your grease trap system clean also helps prevent damage to the system that can come as a result of an obstructed and overloaded trap. 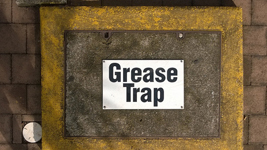 We can help clean up grease traps of almost any size, and we’ll get your trap cleaned out fast. We also have experience working with a wide range of grease trap types and sizes, so we can work with your specific system to make sure that’s it’s cleaned and handled correctly. The grease from your trap will be disposed of properly, in a safe and environmentally-friendly manner once it has been removed from your system. You shouldn’t have to worry about a clogged grease trap getting in the way of your business, and with regular grease trap cleanouts in Windsor-Essex from Hernandez Sanitation, you can prevent grease trap backups before they start. Windsor-Essex grease trap cleaning is just one of the commercial pipe and drain services offered by Hernandez Sanitation. We also offer catch basin cleaning, pipe repair and inspection, sewer, pipe, and drain cleaning, sewer jetting, hydro excavation, and more for our commercial customers, in addition to our complete range of residential pipe repair services in Windsor and Essex County. To learn more, call us today at 519-738-3309 or email us for more information.